Lily is trans and is facing puberty, which will make her look less than herself than she does now, while new kid Dunkin’s manic impulsiveness makes him a misfit; though they click immediately, life gets complicated. According to her author’s note, Gephart promised her son a story with a character who is bipolar like him and promised herself a story of a trans girl, to help foster understanding of people like them. Gephart clearly has a lot of heart, and she tells their stories with compassion. 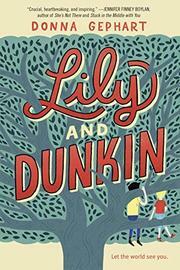 They speak in alternating first-person narration with cursive headers for Lily and block capitals for Dunkin. Dunkin’s insensitivity during manic episodes doesn’t erase the fact that he’s a good kid, and that comes through. But trans readers will likely not recognize themselves in Lily, even if they share some common ground. Lily is perfectly polite, unfailingly kind, with nary a bad thought, angelic right up to her fairy-tale ending. Though Gephart does a good job of rounding out her other characters, Lily is so pristine that she feels mythical, falling into the pile of fiction’s magical misfits so perfect it’s impossible not to accept this one little departure from the norm. There are too few messy, complicated trans heroes that still find love and acceptance in literature for kids, and while cis readers may find it educational, this isn’t going to change that. AS IF BEING 12¾ ISN’T BAD ENOUGH, MY MOTHER IS RUNNING FOR PRESIDENT!